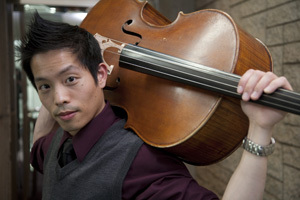 Alexander Cheung, cello, is gaining a reputation as a compassionate, innovative, and inspiring musician of his generation. Alexander graduated from the University of Michigan with a double major in Cello Performance and Movement Science (Kinesiology). He is also a certified personal trainer under the American Council on Exercise. Principal cello teachers include Wayne Smith, Anthony Elliott, and Eric Wilson. Alexander has been awarded numerous accolades throughout his musical journey, competing at the national and international level. While a student at the University of Michigan, Alexander was a recipient of the Martin Luther King Spirit Award, given “in recognition of individuals whose leadership and service exemplify the spirit of the Rev. Dr. Martin Luther King Jr.” His work has been broadcast by NPR, CBC Radio One and Two, and on television. Alexander is one of the founding members of the dynamic string trio, Infinitus. Along with his other colleagues, he arranges, composes, and performs original works, as well as fresh takes on classic compositions. In addition to his duties with Infinitus, Alexander is the co-director of the Vancouver Chamber Players, an organization that presents lesser-known classical works to general audiences and care centres for seniors.